The culture at large is preparing for the inevitable zombie apocalypse. Even the CDC is offering zombie preparedness instructions. But as the church we know that it won’t be a zombie apocalypse, but a zombie Armageddon. The wave of zombies is one of the many frightful signs in the book of Revelation that foretells the second coming of Jesus (depending on whether you believe in a pre-, mid- or post-zombie rapture). But rather than loading the shotguns and boarding up the windows, it’s our responsibility as the church to reach out to the zombie horde. Throughout history it is the church that has stepped forward in moments of catastrophe to care for the least, the last and now the undead. Through zombie discipleship we can teach them that man does live on brains alone. Preach zombie abstinence as you welcome the undead into your church. Perhaps Lazurus can be the patron saint of zombies, the man who came back from the dead to walk among us once more. He managed not to feast on Jesus’ brain (and if you’re going to sample a human brain, wouldn’t the Son of God’s be the ultimate temptation?) and can serve as a role model for zombies everywhere. Zombies need a place to belong. Give them something to do. In many churches you could replace your worship leader, proofreader of even your pastor with a zombie and no one would notice. Let’s be real: Zombies smell, they tend to groan during the sermon and then there’s that nasty habit of feeding on human flesh. Zombie outreach has its hurdles, but those are mere cultural differences. We need to understand that zombie outreach is a cross-cultural affair. Zombies may be different from you and I, but we all need Jesus. 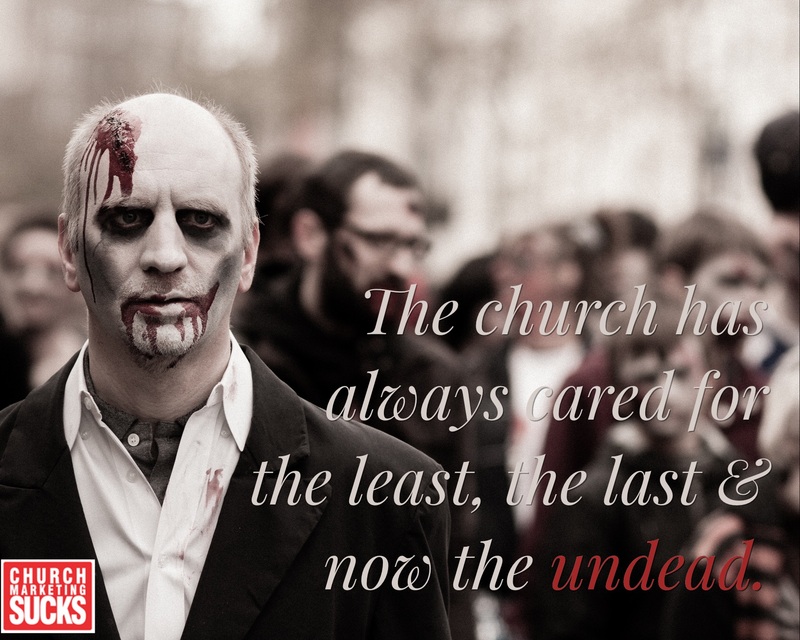 For too long the church has ignored zombies. But who among us hasn’t merely shuffled along at some point in our Christian journey? Who hasn’t responded to the pastor’s intricately detailed theological treatise with a long and raspy moan? Sometimes we’re not that different from zombies, and once we realize that we can reach out with love, grace and rubber gloves. Please remember that we’re an ecumenical organization. We agree on the gospel, that Jesus is the way to salvation, and we agree to disagree on nuances of zombie lore. And for those who find more frustration than education or motivation in this piece, you may be interested to know that the original zombie tale, William Seabrook’s The Magic Island, was a social critique of brutal labor practices by an American company in Haiti. Horror as social justice. I was thinking the same thing as Matt! Just discovered your site too; couldn’t agree more with your domain name! Hi Kevin, it’s not exactly frustrating but illuminating post in a different sense. And I agree with we’re not that different from zombies (in a practical and logical manner not literally though), and once we realize that we can reach out with love, grace and rubber gloves. Cheers. Nice post though. If you will look back even further to the OT, Ezekiel was called to speak a prophetic message to a valley of dead dry bones, and until God gave them the breathe of life they were zombies… LOVE IT. Dem bones, dem bones gonna walk around! This is the wrong message to send to a lost world. Popular culture already sees Jesus as a “zombie” because he rose from the dead. Jesus Christ rose to Life, not undeath. I have more respect for God than to turn his word into the same type of nonsense that you can see on late night television. The world is laboring under strong delusion, so what they need to hear from the church is wisdom. Varon, unfortunately too many people see reaching someone on their level as compromising the Word of God. You don’t have to say Jesus is a zombie nor did this article. Try to be creative and spin it as the world is the living dead (without Christ) or that the Bible shows life being given to the dead… You can be critical or see that your students are being overwhelmed with this zombie mentality so give them something Christ – Centered that they can think on everytime they see a zombie themed item. And I notice the church that is featured has a female pastor. I guess there are no men among them worthy to be called by God. I wouldn’t preach this nonsense because its not going to save souls. Its a shame that woman should have to teach the men. Is there no more wisdom in the Bible? Now we have to resort to contrived messages based on popular culture?